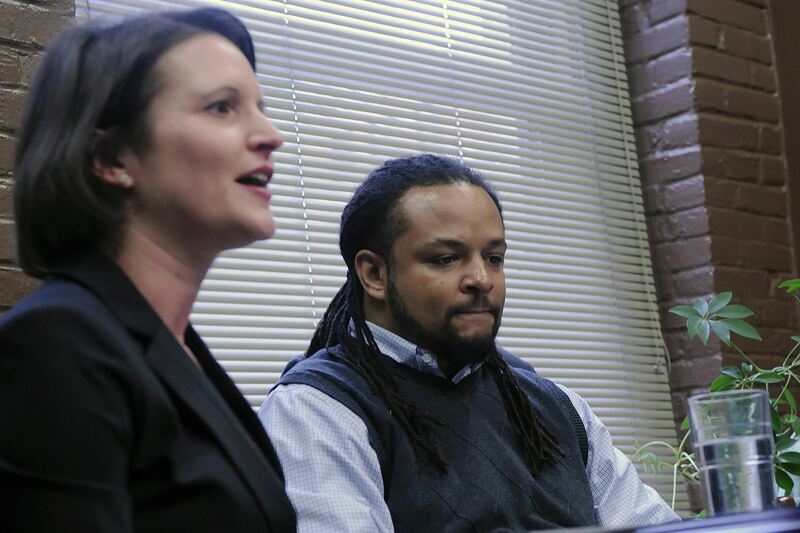 The June arrest of a teacher, which worsened police-community relations in Homewood, is now the subject of a civil rights lawsuit that its authors claim is as much about prompting change as procuring a check. Dennis Henderson, the 38-year-old teacher from North Side whose run-in with Pittsburgh police Officer Jonathan Gromek is the subject of the lawsuit, said Tuesday that his arrest was tough to explain to his 9-year-old daughter as well as his students. "I've worked hard to stay out of the system," Mr. Henderson said at a news conference announcing the lawsuit. "There just shouldn't be a reason my daughter should have to answer to her peers on why her dad was on TV in handcuffs." He said he also had to explain it to his students, some of whom have heard him lecture them on how to behave in an encounter with police. He recounted that a student said to him, "You did everything you tell us to do, and you got slammed." Mr. Henderson, with help from the American Civil Liberties Union of Pennsylvania and attorney Glen Downey, accused Officer Gromek of violating his rights to free speech, freedom from unlawful search and seizure and due process. The Manchester Academy Charter School teacher said that he left a meeting at the Community Empowerment Association, which dealt with efforts to improve relations with police, to give his business card to journalist Rossano Stewart outside. He said that Officer Gromek sped by, veering so close that the two "had to press ourselves against the car to avoid being struck by the vehicle." Mr. Henderson said he exclaimed "Wow!" and the officer turned the car around and "posed the question if I had a problem with his driving." Officer Gromek, who did not respond to a request for comment, wrote in criminal court documents that he turned around because he saw Mr. Henderson shouting when he glanced in his rear-view mirror. Mr. Henderson said he asked Officer Gromek for his name and badge number. He also said that he would record the encounter on his phone. "I refused to give him my phone, and at that point he said, 'Put your hands behind your back,' " said Mr. Henderson. Mr. Henderson said he was handcuffed and told "if I don't get down, he's going to put me down," after which the officer swept him to the ground. Officer Gromek wrote in criminal court documents that Mr. Henderson had been becoming "visibly angry" and "I believed he may have been trying to contact more people to come on scene which would prove to be a safety risk for me, so I instructed him to put away his phone." Mr. Henderson said the reporter with him, Mr. Stewart, was briefly handcuffed but released when one of 10 to 15 officers who arrived later realized he was with the media. Mr. Henderson was jailed for around 12 hours and charged with disorderly conduct, resisting arrest and obstruction of highways -- all of which were withdrawn by Allegheny County District Attorney Stephen A. Zappala Jr. A spokesman for Mr. Zappala said Tuesday that the office has no plans to re-file the charges. Mr. Henderson said he believed the white officer sought to intimidate him because he is black. "If it wasn't racial, I don't know what it was then," Mr. Henderson said. "I don't know if that's the normal practice in Squirrel Hill or anywhere else." "Simply being a black man in a black neighborhood doesn't give police probable cause to stop you, but unfortunately too many of our officers think it does," said ACLU attorney Sara Rose. Sgt. Michael LaPorte, president of the Fraternal Order of Police Lodge No. 1, rejected that characterization. "That is as ridiculous as the ACLU has come," Sgt. LaPorte said. "If you have a neighborhood that is 98 percent black, what type of people should you be pulling over, purple?" Homewood is around 95 percent African American. Around 26 percent of Pittsburgh's population is black, and around 2.5 percent report more than one race. Data released by the bureau indicates that in 2012, 51.1 percent of people subjected to field contacts or warrantless searches were black men, and 8.4 percent were black women. "We pull over people based off violations of the law," Sgt. LaPorte said. "We don't do it based off arbitrary facts. "I have no comment on Gromek in particular other than nothing that he did was unreasonable," he said. Attorney Bryan Campbell, who often represents city police officers accused in civil lawsuits, declined comment. The lawsuit seeks damages and attorney fees. The city is not named as a defendant, but Ms. Rose said the attorneys are "exploring whether any [bureau] higher-ups should be named." The city typically pays settlements or verdicts against its officers. Acting police Chief Regina McDonald declined comment. Ms. Rose said she hoped to talk with city leaders about policing in minority communities, although that might not occur until the mediation phase of the case. She said the existence of a partial audio recording of the incident should help to document the incident, taking it beyond the realm of he-said-she-said cases. The city's Office of Municipal Investigations sustained accusations against Officer Gromek of conduct toward the public, conduct unbecoming and incompetency. A bureau disciplinary hearing is set for Tuesday. The Citizen Police Review Board plans to set a date for a public hearing on the matter at its Dec. 3 meeting. Officer Gromek, 30, joined the force in September 2005 and was scheduled to earn $59,587.42 this year. Since Mr. Henderson's arrest, he has been reassigned from Zone 5 to the bureau's warrant office. "I don't want to see him on the streets," Mr. Henderson said. The bank must pay back wages and interest to 1,147 black job applicants for race-based hiring discrimination. COLUMBIA, S.C. -- Bank of America has been ordered to pay nearly $2.2 million in restitution for discriminating against more than 1,100 black job seekers. Judge Linda S. Chapman of the U.S. Department of Labor has ordered the bank to pay 1,147 African American job applicants $2,181,593 in back wages and interest, for race-based hiring discrimination at the company's Charlotte, N.C., facility. The Department of Labor's ruling awards $964,033 to 1,034 applicants who were rejected for jobs in 1993, and awards $1,217,560 to 113 applicants rejected between 2002 and 2005. The ruling also orders Bank of America to extend job offers, with appropriate seniority of position, to 10 individuals included in the class action, as those positions become available. The judge determined that the bank had applied unfair and inconsistent selection criteria in the hiring process, which resulted in the rejection of qualified black applicants for teller and entry-level clerical and administrative positions in the company. "Judge Chapman's decision upholds the legal principle of making victims of discrimination whole, and these workers deserve to get the full measure of what is owed to them," said Patricia A. Shiu, director of the Department of Labor's Office of Federal Contract Compliance Programs. The Office of Federal Contract Compliance Programs initiated routine compliance reviews in November 1993. Those reviews revealed systemic hiring discrimination affecting black job seekers in the Charlotte location, and following efforts of conciliation that went nowhere, the Solicitor of Labor filed an administrative complaint against the company in 1997. The filing stated that Bank of America had violated an executive order, which prohibits federal contractors from discriminating in employment practices on the basis of race. Bank of America, as a federally-insured financial institution that provides a variety of services and products, is a federal contractor and falls under the purview of the Office of Federal Contract Compliance Programs. The Department of Labor alleges that Bank of America repeatedly challenged the contract compliance programs' authority. "Our investigators and attorneys prevailed despite decades of stalling tactics," said Solicitor of Labor M. Patricia Smith. Here are some details about the BOA case and other backpay/discrimination lawsuits that sound a warning to all employers to take extra care to avoid discrimination and offer a reminder about the tenacity of federal agencies. The ruling in the BOA case awards $964,033 to 1,034 applicants who were rejected for jobs in 1993 and $1,217,560 to 113 individuals who were rejected between 2002 and 2005. It further orders the BOA to extend job offers, with appropriate seniority, to 10 class members as positions become available. After hearing from experts on both sides, the judge agreed with the government's positions on every issue in dispute. Notably, she rejected the bank's arguments for a lower award on the grounds that they could not take advantage of missing records that they had failed to keep. In an earlier ruling, the judge determined that the bank applied unfair and inconsistent selection criteria resulting in the rejection of qualified African-American applicants for teller and entry-level clerical and administrative positions at the company's Charlotte facility. “The ruling represents a major victory in a case that has spanned nearly two decades, during which Bank of America repeatedly challenged the authority of the department's Office of Federal Contract Compliance Programs,” says the DOL. "Wherever doors of opportunity are unfairly closed to workers, we will be there to open them—no matter how long it takes," said OFCCP Director Patricia A. Shiu. "[This] decision upholds the legal principle of making victims of discrimination whole, and these workers deserve to get the full measure of what is owed to them." On November 24, 1993, the OFCCP initiated a routine compliance review that revealed indications of systemic hiring discrimination affecting African-American jobseekers at the Charlotte facility. After conciliation efforts failed, the Solicitor of Labor in 1997 filed an administrative complaint against the company for violating Executive Order 11246, which prohibits federal contractors from discriminating in employment practices on the basis of race. "Our investigators and attorneys prevailed despite decades of stalling tactics," said Solicitor of Labor M. Patricia Smith. "This case demonstrates that the department will not be deterred in our pursuit of justice for jobseekers." The BOA may be regretting its decision to continue to fight this battle, especially because we’re guessing that over the 20 years this case went on, the lawyers’ fees and other costs and distractions have added substantially to the total costs the BOA has sustained.